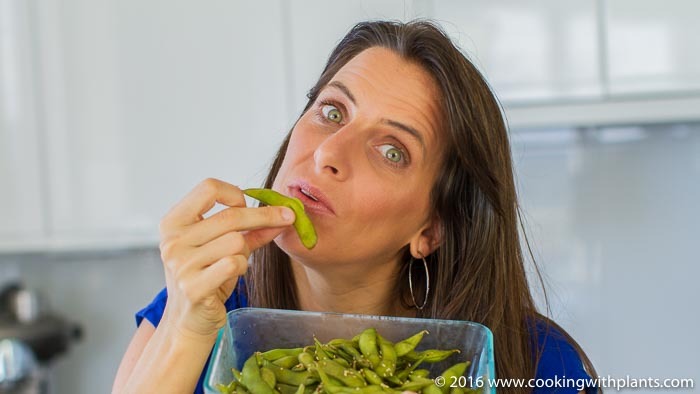 Today I show you how to cook and eat edamame. This is a healthy snack made of soy beans in their pod (I use frozen). Fresh, tasty and good for you, this is the ultimate vegan fast food idea. Also great to pack in your lunch box or just for general munching when you want something to nibble on. Enjoy! Put in as much frozen edamame as you want to make and leave on low boil for 8 minutes. Remove from heat and strain edamame. Place edamame (in pods) on a large platter or in a bowl and sprinkle with sesame seeds and some salt. Hold each end of the pod with your thumbs and pointing finger. Move your fingers along and push each soy beans out into your mouth to eat. Dispose of the actual pod. (See video at top of page for full demo). Hi Anya, I went to a Japanese restaurant where the staff showed us how to eat edamame. They recommended to cup one hand around your mouth as you pop the bean with the other hand (to stop the beans from flying across the table and hitting other guests!) They showed us how to do it – don’t know if it’s really authentic Japanese style, but it was a funny and entertaining tutorial and I have always done it that way since!